Holiday credit cards or pre paid travel cards can bring excellent savings when it comes to foreign currency exchange. There are pros and cons within the huge range of holiday credit cards and research should be undertaken before applying. What Are Holiday Credit Cards? There are credit cards on the market that can bring big savings to consumers who are on holiday. Holiday credit cards come in two forms; fee free credit cards and travel cards. These can also come in the shape of pre paid credit cards or regular credit cards. Many people exchange currency by using the traditional travel agents and bureau de change shops, which means paying commission fees. Undertaking a little research can bring big savings and in some cases can even eliminate the fees normally charged when exchanging currency. Most people will exchange currency before flying abroad and then will use automated tellers to withdraw cash while on holiday. This can mean holiday makers are being hit with fees every time they withdraw money abroad. Interest will also be added on top of the withdrawal fees, usually higher interest if money is withdrawn abroad. But there are certain credit card providers that now do not charge any fees for customers using their credit card abroad. Lenders such as the Halifax have introduced no fee credit cards that can be used to withdraw money abroad but will incur no higher rate of interest. Those who are considering opening up a new credit card account before going on holiday should undertake some research. There are a few credit cards that will not charge foreign loading fees. Loading fees are additional charges, for example an extra fee when using a credit card in a restaurant abroad. Credit cards provided by the Post Office do not charge a loading fee or withdrawal fees abroad. But although some cards eliminate these fees they may add higher interest charges when withdrawing money abroad. Pre paid credit cards are the ideal option for people who cannot normally obtain credit cards. The cards are pre loaded with cash and then can then be used in just the same way as regular credit cards. Pre paid credit cards can also be used abroad to pay for service such as restaurant bills or for withdrawing foreign currency at automated tellers. Pre paid credit cards do however come with a range of different fees. These will usually include application fees, fees when loading money, transactions fees and fees when withdrawing money. As with credit cards, it’s important to compare pre paid credit cards before applying. 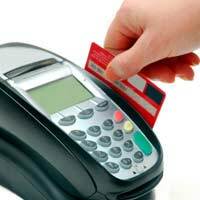 There are certain pre paid credit cards that are specifically designed to be used abroad. These pre paid travel credit cards can greatly reduce or eliminate fees when making transactions abroad, and when making withdrawals from automated tellers. As with credit cards look at which service is most likely to be used when on holiday. If making more automated teller withdrawals than transactions such as paying restaurant bills go for the card that will be of the most benefit. There are great deals to be had when searching for holiday credit cards. Keep a look out for introductory offers that eliminate application fees. For example, holiday makers who are booking airport parking through a company called Holiday Extras can receive a pre paid holiday credit card absolutely free of charge. The application fee for this pre paid credit card would normally be £9.95. Always use holiday credit card comparison sites to ensure the best deals on this type of travel card.